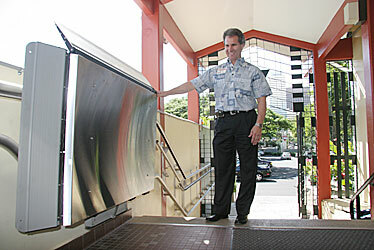 Mike Doss, senior vice president of YMCA of Honolulu, shows off the new lift at the Nuuanu facility's entrance. Question: While soaring above Kaena Point with the Original Glider Rides recently, the question came up: Why is the road not improved so that there is access between Yokohama Bay and Mokuleia? Answer: Because Kaena Point's relative isolation on the westernmost tip of Oahu has made it a scarce and precious home to native plants and animals. "Many people want to keep the area in its natural state," said Deborah Ward, spokeswoman for the state Department of Land and Natural Resources. The state designated 43 acres at the tip of Kaena Point as a Natural Area Reserve in 1983, after decades of off-road trafficking by Jeeps, trucks, motorbikes and other vehicles severely damaged and eroded the coastal area. DLNR's Forestry and Wildlife Division manages the reserve, which is part of Kaena Point State Park, and prohibits motor vehicles there. The area is said to be one of the last intact dune ecosystems in the main Hawaiian Islands: "Intact coasts are only found at remote sites, and these last glimpses of the ancient past of Hawaii are precious," DLNR says. One of the largest colonies of seabirds in the main Hawaiian islands can be found within the Natural Area Reserve, while Hawaiian monk seals frequently make their way there and humpback whales often can be spotted offshore during the winter breeding season. Additionally, many native coastal plants grow there, including naupaka, ilima and naio, as well as 11 federally endangered species, such as akoko, a species found only at Kaena Point, according to DLNR. However, nesting seabirds and native plants are said to be under "constant threat from predatory animals," with dogs killing more than 100 of them in 2006 despite control efforts. To better protect the native bird and plants, DLNR, the U.S. Fish and Wildlife Service and the Hawaii Chapter of the Wildlife Society are proposing to construct a 1,640-foot to 2,130-foot, 6.5-feet-high fence along the base of the Waianae Mountains. The fence would keep out dogs, cats, mongoose, rats and mice, but still allow public access for fishing, hiking, biking, etc. Based on a design developed in New Zealand, it would be the first "pest-proof fence" of its type built in the United States. Projected cost is $250,000 to $300,000, with most of it funded by a federal grant. Because the project would be in a conservation district and a special management area, it is required to go through an environmental review process, explained Christen Mitchell, a planner with DLNR's Forestry and Wildlife Division. A draft environmental assessment of the project (posted at www.dofaw.net, click on Kaena Point Ecosystem Restoration Draft EA in left column) is open to public comment until Tuesday. Permits also have to be obtained from the city in order for the project to proceed. No final decisions have been made as to the alignment of the fence, Mitchell said, and, as of now, there is no timetable as to when the project could start. "Ideally, we'd get it up as soon as possible to protect the wildlife," she said. "But it's not going to be at the expense of going through the appropriate process." Mitchell said the initial public feedback generally has been positive. For more information or to comment, call Mitchell at 587-0051, e-mail kaenapoint@yahoo.com or write to DLNR Natural Area Reserves System, 1151 Punchbowl St., Honolulu, HI 96813. The lift is expected to be operational Feb. 19 and will accommodate people using wheelchairs, walkers and strollers.